Coming into summer, we see an array of health issues when we are grooming, and perhaps one of the most misunderstood problems are heat spots, so what are they are what can we do to help? Heat spots are a localised skin infection (also commonly called moist dermatitis) and can be caused by bacteria entering the skin in several ways. One of the main reasons we see heat spots in summer is because the dog is scratching and bacteria can easily enter slightly broken skin and a heat spot can quickly form. The area which usually starts off as a red patch on the skin, can quickly spread over several hours from the size of a coin to the size of your hand if your pet is licking and chewing at it, so it is imperative that they leave it alone even if you have to resort to an Elizabethan collar so they can’t reach the spot. For smaller heat spots, healing is usually reasonably quick if the area is clipped of fur to let the air in and given regular saline rinses or diluted Betatine solutions and patted dry but if the area is spreading it is important to go to your vet in case antibiotics are in order. Some dogs are more predisposed to heat spots than others, and owners of such dogs usually notice a warm patch of skin where the dog has been nibbling and infection is building, followed by a dampness which develops into a pus filled area. As the sore begins to dry and heal it will form a scab and that is natures band-aid so it’s important to leave it in place to allow healing underneath. At some point, it will fall away on its own. So how to prevent heat spots? Well, firstly it is important to find out why your dog is scratching and do what you can to prevent it. 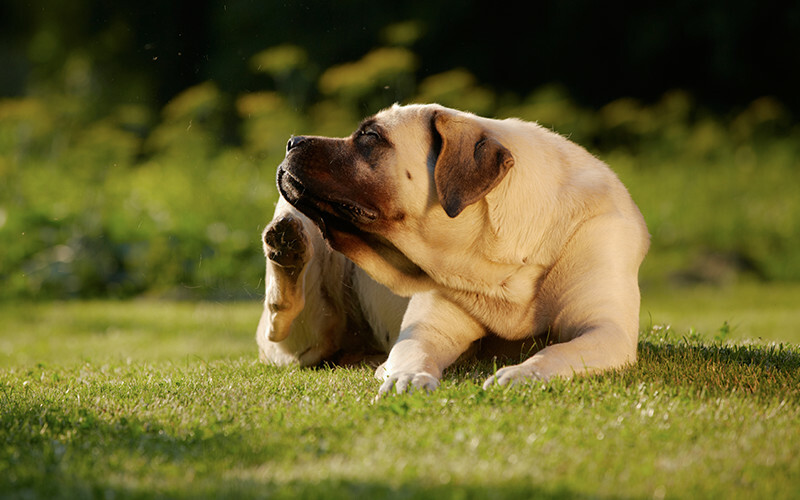 Make sure you keep fleas under control and check ears are clean and smelling fresh as ear infections can cause scratching around the head and neck. Even cats get these types of sores from fighting or mating (where males will often chew on the female’s neck). Keeping your long haired or thick coated breeds regularly groomed will help keep the dog cool and your groomer can get a better look at the skin using a force dryer to part the fur and see straight to the skin which is usually not possible at home. Jim’s Dog Wash groomers have ways to sanitise their equipment to eliminate bacteria but it is important that if your dog has been trimmed short, they do not scratch too hard not realising that they don’t have a thick coat anymore so they can make a scratch much more easily.